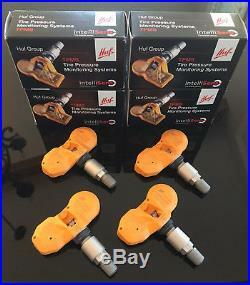 Set of Four HUF / BERU TPMS TIRE PRESSURE MONITORING SENSOR 433MHz. 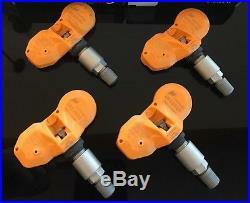 4 pcs of HUF TPMS Units (RDE-008 and RDE-011coverage) 4 pcs of HUF TPMS Silver Valve stems. 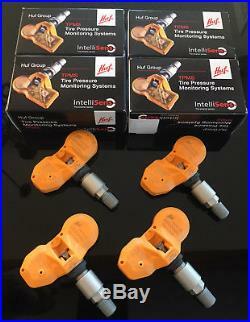 Note: These Beru / Huf IntelliSens TPMS are already programmed by the US Distributor. They are ready to install and sync-ed to the vehicle upon installation. Please indicate year make and model vehicle during or after checkout process. BMW 1 series (coupe, cabriolet/convertible); 2007 – 2010 BMW 1 series (coupe, cabriolet/convertible); 2011 OEM part number check from dealership required for this vehicle. BMW 1M coupe; 2011 OEM part number check from dealership required for this vehicle. BMW 3 series (E90 sedan, E91 wagon/avant, E92 coupe, E92 cabriolet/convertible); 2007 – 2009 BMW 3 series (E90 sedan, E91 wagon/avant, E92 coupe, E92 cabriolet/convertible); 2010 OEM part number check from dealership required for this vehicle. BMW M3 E90 sedan, M3 E92 coupe, M3 E92 cabriolet/convertible; 2007 – 2009 BMW M3 E90 sedan, M3 E92 coupe, M3 E92 cabriolet/convertible; 2010 OEM part number check from dealership required for this vehicle. BMW 5 series sedan, wagon/avant; 2007 – 2010. BMW 5 series sedan, wagon/avant; 2011 OEM part number check from dealership required for this vehicle. BMW M5 sedan; 2007 – 2010 BMW M5 sedan; 2011 OEM part number check from dealership required for this vehicle. BMW 6 series coupe, cabriolet/convertible; 2007 – 2010 BMW 6 series coupe, cabriolet/convertible; 2011 OEM part number check from dealership required for this vehicle. BMW M6 coupe, M6 cabriolet/convertible; 2007 – 2010 BMW M6 coupe, M6 cabriolet/convertible; 2011 OEM part number check from dealership required for this vehicle. BMW 7 series sedan; 2007 – 2010 BMW 7 series sedan; 2011 OEM part number check from dealership required for this vehicle. BMW X3; 2007 – 2010 BMW X3; 2011 OEM part number check from dealership required for this vehicle. BMW X5; 2007 – 2010 BMW X5; 2011 OEM part number check from dealership required for this vehicle. BMW Z4; 2007 – 2009 BMW Z4; 2010 OEM part number check from dealership required for this vehicle. BMW OE Part Numbers. 36236781847, 36236779490, 36236781847, 36236798726. Compatibility: RDE008 / RDE011 coverage. Pre-programmed and ready to install. HUF RDV021 Gen 2 Valve Stems included. In some cases, sensors that feature’auto re-learn’ (mainly European applications) will communicate with the vehicle automatically, once installed correctly and the vehicle driven. Accessing the reset/relearn can be done through your OBC (on board computer). These TPMS are designed for Factory Wheel Equipped vehicles. We cannot guarantee fitment for. The item “TPMS TIRE PRESSURE SENSORS HUF RDE008 2009 BMW 335i 328i 135i 128i 36236779490″ is in sale since Monday, September 3, 2018. This item is in the category “eBay Motors\Parts & Accessories\Car & Truck Parts\Wheels, Tires & Parts\Tire Pressure Monitor Systems”. The seller is “eurowheelsusa” and is located in Placentia, California. This item can be shipped to United States, Canada, United Kingdom, Denmark, Romania, Slovakia, Bulgaria, Czech republic, Finland, Hungary, Latvia, Lithuania, Malta, Estonia, Australia, Greece, Portugal, Cyprus, Slovenia, Japan, Sweden, South Korea, Indonesia, Taiwan, South africa, Thailand, Belgium, France, Hong Kong, Ireland, Netherlands, Poland, Spain, Italy, Germany, Austria, Israel, Mexico, New Zealand, Philippines, Singapore, Switzerland, Norway, Saudi arabia, Ukraine, United arab emirates, Qatar, Kuwait, Bahrain, Croatia, Malaysia, Brazil, Chile, Colombia, Costa rica, Dominican republic, Panama, Trinidad and tobago, Guatemala, El salvador, Honduras, Jamaica, Antigua and barbuda, Aruba, Belize, Dominica, Grenada, Saint kitts and nevis, Saint lucia, Montserrat, Turks and caicos islands, Barbados, Bangladesh, Bermuda, Brunei darussalam, Bolivia, Ecuador, Egypt, French guiana, Guernsey, Gibraltar, Guadeloupe, Iceland, Jersey, Jordan, Cambodia, Cayman islands, Liechtenstein, Sri lanka, Luxembourg, Monaco, Macao, Martinique, Maldives, Nicaragua, Oman, Peru, Pakistan, Paraguay, Reunion, Bahamas, Viet nam. tpms | 128i, 135i, 328i, 335i, pressure, rde008, sensors, tire, tpms | Bookmark the permalink.